With omega west coast ale II yeast. I want to brew tomorrow, do you think that is too soon to pitch this? ( would be about 48 hours for the starter). The OG of the red ale is only 1.044, I was really just wanting to try a starter for the first time. Also, should I chill it and dump the wort before pitching or will it not make any difference in the 5 gallon batch? Thank you, yes I did record the time, that picture was 12 hours from the initial pitch in the flask. I did not notice any date on the yeast package ( omega). I noticed most calculators need the yeast date to estimate cells. Maybe I missed it somewhere. When you say " dump the cap" do you mean all the wort above the settled yeast cake? I'd brew today except we are in the midst of another rain/ sleet/.snow storm here. Tomorrow will be much nicer I think. Well the Irish red is in the fermenter now. I took my starter out of the fridge this am, about 5 hours before pitching it. 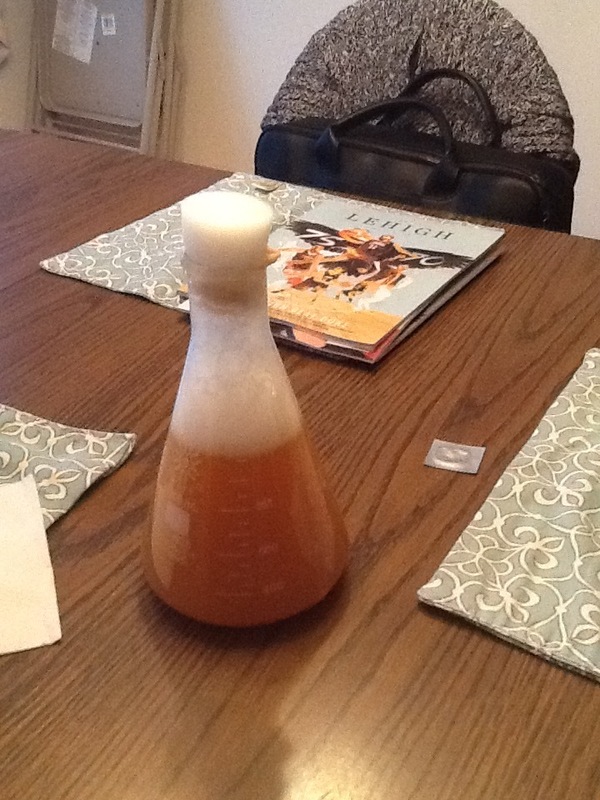 I took the foam plug out, spritzed some sanitizer around the top of the flask, then I dumped most of the wort out of the flask, left some at the bottom and swirled it to raise the yeast cake off the bottom then poured into the primary ( after rocking the primary around ). Now hopefully by morning I will see some action. The beer was a little cool due to the water top off ( extract kit), so I guess it could slow things a bit till it warms up to room temp. Should I have done anything different ? Nope, you did exactly right! Now, depending on how your room temp. is, you actually might want to keep the temperature of the fermentation on the low side. Temps that are too high often lead to off-flavors that take a long time to disappear (if they ever do). Best to keep the fermentation, especially in the 1st couple days, somewhere in the low-mid 60's. Google 'swamp cooler'. They really do work. I even do lagers with fermentation temps in the 40's-50's in them(in the winter of course). Hey thanks! I have been sitting here wondering if I did it right ( while drinking a couple of my last heffe's). My room temp where the primary sits is about 65-66 deg. My next step is to get a fridge or chest freezer for the basement to make a nice chamber for summer and winter a sell as doing some lager batches that my son wants to do. My challenge is I want to find a freezer large enough to hold 2 primaries. I will tell you I have a hard time keeping beer in stock with a thirsty 22 year old in the house. So we may start doing some double batches. It's hard to find a chest freezer that has the depth for the bubbler and airlock on top. I may be forced to go with an upright I guess and maybe two separate small units. Yes I have some activity now in the bubbler. Switched to the 3 piece bubbler and it saves a couple of inches in height. I bought a large blow off tube but I have not checked to see what the bend radius could be. Maybe I could just use a smaller more flexible tube? Thank you for all the help! It beats driving blind through all this. A chest freezer is the next item on my list. That would be great if I can get by with a 7 cu ft.